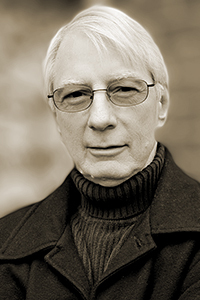 R.T. Smith is the author of fourteen collections of poetry, most recently In the Night Orchard (Texas Review Press, 2014), and four short story collections, most recently Sherburne (Stephen F. Austin University Press, 2011). His work has appeared in Esquire, The Best American Short Stories (Houghton Mifflin, 2004), and The Best American Mystery Stories (Houghton Mifflin, 2006). Smith’s awards include the 2013 Carole Weinstein Prize in Poetry, two Library of Virginia Annual Literary Awards for Poetry, and three Pushcart Prizes. He is the Writer-in-Residence at Washington and Lee University, where he edits Shenandoah.